Repairing cars is a lot easier if you have a good tap and die set that provides all of the right parts within reach. Anything less will leave you hunting for the right drill bit or extractor through a morass of look-alike parts. Frustration is all but guaranteed. Picking the right tap and die set is a minefield, however. It’s hard to anticipate exactly which parts you’ll need. Furthermore, if the parts aren’t of high quality, they’ll quickly become deformed and unusable. In this article, we’ll round up a few of the best tap and die sets on the market so that you’ll know which are good options. By the time you’re done reading, you’ll know exactly what kind of tap and die set will be the right choice for your garage or shop. How Long Should My Tap And Die Set Last? How Do I Keep My Tap And Die Set In Good Condition? What’s The Best Material For Tap And Die Sets? There are a handful of features which you’ll need to pay attention to while selecting a tap and die set to call yours. First, the tap and die set should be comprehensive. You don’t want to be in need of a particular tap or die and then not have it in your set. At that point, you’re out of luck. The easiest way to guarantee that your set is comprehensive is to get a set with a ton of pieces. The sets list the number of pieces they have, and many can contain up to a hundred pieces or more. The consequence of a set with more pieces is that it will be heavier. Because you probably will not be moving your tap and die set around that much, having a set be heavy is not a very bad consequence to bear. Heavy sets also tend to more durable. Durability is something that you need with a tap and die set because they will be regularly subjected to a lot of stress while they are used. The better material and shape the taps and dies are made of, the better they will hold up. There is a flip side to heavy-duty dies too, however. Some heavy-duty tap and dies will not fit into your equipment where they need to go. These are often hard to detect by sight because the tolerances are so narrow. Nonetheless, you should still opt for heavier and stronger taps and dies as much as possible. Having a good case for your tap and die set is also essential. Your case is the main way of bringing them around, and it’s also responsible for keeping your set organized. If the case doesn’t have a logical way of organizing the pieces, you will be fumbling to find the right one. Organization is more or less a personal preference. Whichever kind of organization makes the most sense to you is the best. A case which is flimsy will also cause problems. If the clips holding the case shut break, your taps and dies will fall everywhere. Finally, you should get a tap and die set that is in the measurement system that you use the most. Some kits are only in metric whereas others are only in imperial. There are kits which contain both and label both types appropriately, but these are often redundant and thus harder to use than they need to be. The IRWIN Tools Hanson Machine Screw/Fractional/Metric Tap and Hex Die and Drill Bit Deluxe Set, 117 Piece is the suite of tools that you’ll need to make your work faster and easier than ever before. 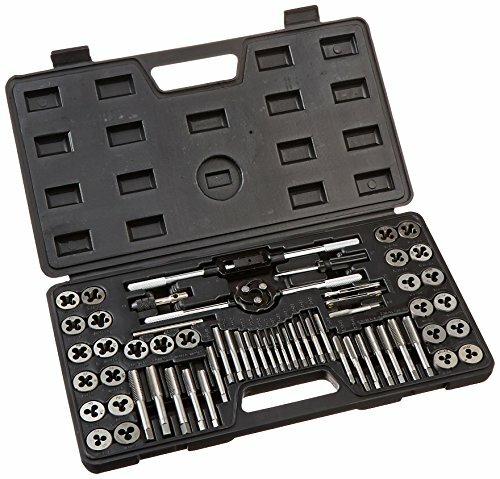 Irwin has produced another great and easy to use toolkit with this tap and die set. Everything you need to rethread fasteners and setup fastener holes is included. That means you’ll find drill bits, extractors, taps, and dies under the same hood. The pieces are arranged in an intuitive way such that you’re never at a loss for where you should look to find a tap or die of a particular size. Everything from the spiral screw extractors to the t-handle wrench is right where you expect it to be. The only real downside of the Irwin kit is that the box for the taps and dies is a bit weak. The latches are easy to break, which might be an issue if you are throwing the entire kit into the back of your truck for a call on the road. Nonetheless, it’s hard to go wrong with the Irwin set because of how comprehensive the tools are and how intuitive they are to use. 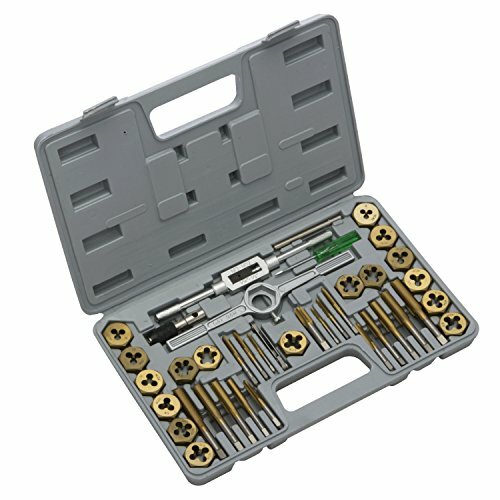 The GearWrench 3887 Tap and Die 75 Piece Set – Combination SAE/Metric is a lightweight tap and die set that’s ready to travel with you wherever you need to go. The GearWrench kit opts to be lean. There tap and die set isn’t comprehensive, and other tools are kept to a minimum. The result is that you have everything you need in a small package, but no extra frills. There are advantages and disadvantages to this set design philosophy. You won’t need to worry about losing the taps or the dies, nor will you be beset by a bunch of tools which are redundant with your other toolkits. You may find yourself wanting for a particular tap or die on occasion, however. Nonetheless, this set is a bargain. All 75 of the pieces in the set are high quality and logically organized. The carrying case is built to withstand a lot of abuse, and the tools are ergonomically designed. 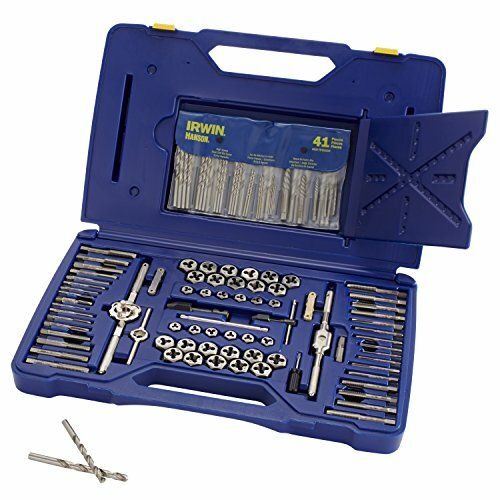 The Neiko 00911A Tap and Die Set, Premium, SAE, Titanium Coated, 40-Piece is a bargain set which compromises on comprehensiveness for the sake of durability. Unlike other tap and die sets, the Neiko set is titanium coated rather than being purely stainless steel. The advantages of this construction are not obvious at first glance. In a nutshell, coating the taps and dies with titanium makes them more resilient to mechanical and chemical stress. In other words, these taps and dies are heavily protected against the kinds of things that end up making them unusable in the long run. In the short run, they’re as vulnerable to the stresses of normal usage as any other tap and die set. This is a bit of an issue for this set because there simply are not very many taps and dies in the kit to begin with. 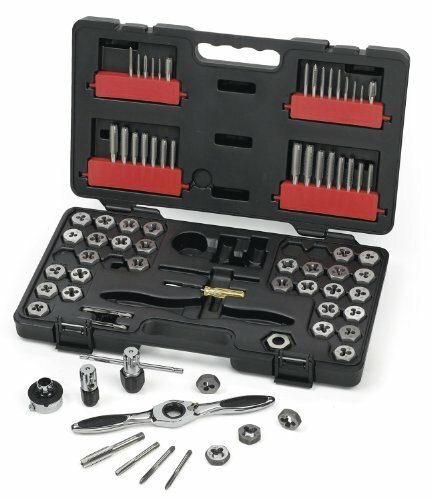 This kit is probably better for people who intend to only use their tap and die set very infrequently. Over long periods of unuse, the special titanium coating on the kit becomes more valuable. Until that long-term period, however, these taps and dies are not going to show their value. Some operators may become frustrated with their limited selection and relative brittleness. 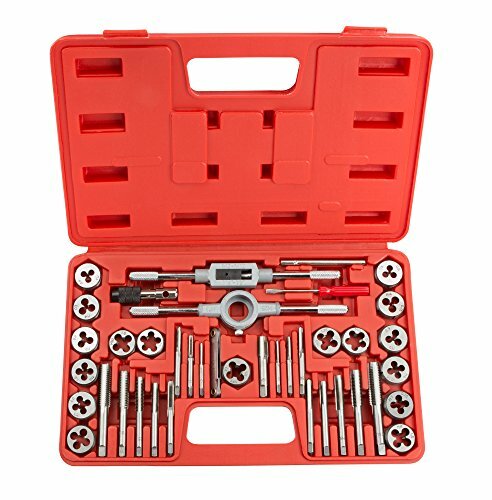 The Gino Development 02-0554 TruePower Alloy Steel SAE/Metric Tap and Die Set (60 Piece) is a no-nonsense tap and die set which will stand up to a huge amount of abuse for a very low price. The Gino Development tap and die set is tough to beat as far as durability is concerned. Each of the taps and dies is constructed a bit more heavy duty than they would otherwise normally be. You won’t need to worry about wearing out this tap and die set with aggressive use. The kit is well organized and contains a minimal number of other tools. This means that it remains lightweight despite being relatively comprehensive. The only real disadvantage that this tap and die set has is that it is heavy. The heavy-duty nature of the parts in the set means that each weighs up to twice as much as what they might weigh in an equivalent set. For most applications, this isn’t a concern. The main problems occur because some of the pieces are larger than they would be in other sets. For some pieces, there is no noticeable problem. For pieces designed for precision fitting in tight spaces, you may run into issues. The TEKTON 7559 Tap and Die Set, Metric, 39-Piece is a standard tap and die set which has a few extra protections against over-threading that can come in handy. The TEKTON tap and die set seems normal at first glance. The selection of taps and dies is not extensive, nor is the carrying case particularly high quality. The set appears to be of average construction. The TEKTON set has a number of majorly useful ease-of-use features which don’t appear at first glance, however. First, all of the taps and dies are tapered and have a coarse texture. This protects against over-threading in nearly all situations, and most other sets don’t have the feature. Likewise, the scoring on the outside of the taps and dies helps them to be easy to handle. You won’t need to fumble to grip onto the elements of the set. This means that the set seems faster to use than other equivalent sets. You will also find that the pieces in the set don’t get dropped as frequently, which will help them to avoid becoming lost. Your tap and die set should last a long time. The more aggressively you use your tap and die set the faster it will wear out. Likewise, if you subject your tap and die set to a lot of chemical stressors which would cause rust or corrosion, they will degrade much faster. The coating on the tap and die set will also contribute a substantial amount to its longevity. Some sets are coated with titanium or other corrosion resistant materials. Corrosion-material coated sets are not necessarily much more expensive, so you should grab one if you have the opportunity. On the flip side, you should avoid kits that are not made out of rust and corrosion resistant materials. The best way to keep your tap and die set in good condition is to keep it clean. If your tap and die set gets dirty during use, clean it off with some water. If your tap and die set is oily or greasy, it may be acceptable to use a small amount of warm soap and water. Aside from cleaning them when dirty, you should try to avoid putting too much stress on any one tap and die. If you find yourself using a tap or a die more than any other, it might be worth picking up a second copy of it so that you can alternate between the two and extend both their lifetimes. Finally, avoid exposing your tap and die set to extreme temperatures as much as possible. Extreme temperatures, when paired with frequent use, will cause the metal to warp more than it would otherwise. Typically, stainless steel alloy is the best material for tap and die sets because it strikes the right balance between hardness and durability. Stainless steel alloys are easy to preserve and clean. You won’t need to worry about deforming them with frequent vigorous use.